In a Washington D.C. Metro Station, on a cold January morning in 2007, this man with a violin played six Bach pieces for about 45 minutes. During that time, approximately 2,000 people went through the station, most of them on their way to work. After about 3 minutes, a middle-aged man noticed that there was a musician playing. He slowed his pace and stopped for a few seconds, and then he hurried on to meet his schedule. At 45 minutes: The musician played continuously. Only 6 people stopped and listened for a short while. About 20 gave money but continued to walk at their normal pace. The man collected a total of $32. In a common-place environment, at an inappropriate hour, do we perceive beauty? If so, do we stop to appreciate it? 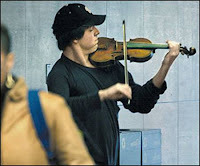 Do we recognize talent in an unexpected context? If we do not have a moment to stop and listen to one of the best musicians in the world, playing some of the finest music ever written, with one of the most beautiful instruments ever made; how many other things are we missing as we rush through life?